Application for estimate the flight time of a jump. The user do jumps with smartphone positioned in your body statically for the application measure the time during the user is in the air. 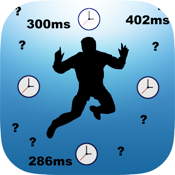 This application save a history of jumps to the user see if he improve your jump time or not.